For over 30 years, First American Home Protection Corporation, a subsidiary of First American Corporation, has been in the business of providing home warranties to homeowners, and those involved in real estate transactions, around the nation. Coverage offerings vary depending upon the home’s location and the status of the purchaser. First American Home Buyers Protection Corporation services several types of clients with two kinds of plans. The type of plan a purchaser qualifies for depends upon their current position. There is a plan for homeowners, and another plan that is geared towards real estate agents and people who are in the process of buying or selling their home. Both plans have coverage that varies by location, so someone in California might have different appliances and systems covered than someone in Arizona, for example. Like many home warranty plans, there is a 30-day waiting period before the purchaser can make a claim. One unique feature for people involved in real estate transactions is the potential coverage of unknown pre-existing conditions. Homeowners can decide from two different plans. The Basic Plan covers large appliances, including dishwashers, garbage disposals, trash compactors, ovens, ranges, cooktops, built-in microwaves, refrigerators, and clothes washers and dryers. The Premier Plan covers all of the appliances listed in the Basic Plan, along with systems, such as plumbing, heating, ductwork, water heaters, electrical, garage door openers and central vacuum systems. Add-on services include coverage for central air conditioning, pool/spa equipment, additional refrigerators, well pumps, and upgraded coverage for certain appliances and systems. The packages for people involved in real estate transactions are a little bit different. They combine plans to offer more coverage in some areas, and less in others. The Basic Plan includes much of the systems in the house, plus some appliances and coverage for items that is not available for current homeowners. The things that are not included can be added as extra coverage, depending upon if the purchaser is a buyer or seller. Sellers can add-on upgraded coverage and coverage for air conditioners and ductwork. Buyers can add coverage for central air conditioning, clothes washers and dryers, refrigerators, pool and spa equipment, limited roof leaks, septic systems, and sewage and well pumps. As stated previously, available coverage varies by region. To utilize a warranty, policy holders can place a claim using the online system or by calling the First American Home Buyers Protection Corporation hotline. They will then contact the appropriate contractor, who will schedule an appointment with the policy holder. The policy holder must pay a $60 service fee at the time of the appointment. Some consumers complain of long wait times when it comes to having repairs done, or getting a replacement for the damaged item. 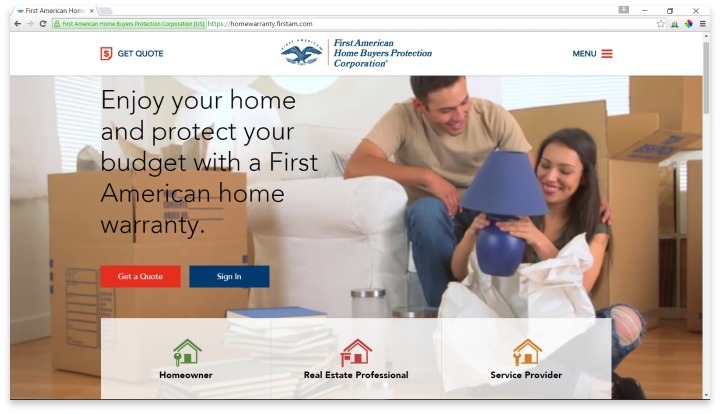 This seems to be due to communication issues between First American Home Buyers Protection Corporation and the independent contractors they work with, as the customers receive different information from both parties. This issue is not standard for all policy holders, and many say they have received quick service. There have also been reports of First American Home Buyers Protection Corporation replacing higher end equipment that has broken down with cheaper equipment. This seems to be standard among many home warranty companies, but it is worth noting that consumers may not receive the same quality appliance or system if it needs to be replaced. First American Home Buyers Protection offers two kinds of plans. One for homeowners, and another plan that is geared towards real estate agents and people who are in the process of buying or selling their home. American Home Buyers Protection Corporation is a home warranty provider that services many areas in the nation. It seems that their service and outcome of claims depends upon the region the consumer lives in. This is probably due to the different contractors found throughout the US, who all have differing work ethics and abilities to communicate effectively. Due diligence should be done to determine the amount of contractors that service a particular region before committing to any of the plans. Have you had an experience with this company? Please share your PowerReviews.com reviews below. My husband filed a claim on 6/21/16 that our air conditioner has stopped working. It has been two weeks since the original claim was placed and I have not received even a timeline on when our air conditioner will be fixed. Temperatures have exceeded 90 degrees multiple days during these 2 weeks, which threatened the safety of my dog. On 6/22/16 the contractor came out for about 5 minutes and said he had to talk to First American Home Buyers Protection Corporation to see what they would like to do. The contractor reported to me that he filed the report on 6/23/16. A representative lied to my husband during phone conversations on 6/24/16 and 6/26/16 stating the report was not filed yet. The contractor stated he resubmitted the report on 6/27/16. I personally spoke with him immediately after he resubmitted the report. I received an email confirmation that the report was submitted and an email that confirmed parts were ordered at the exact same time (6/27/16 at 9:33am). It would be impossible for the company to receive the report and order the parts at the exact same time, which supports the statement that my husband was lied to about the original report. I called the company on 7/1/16 because we had not heard anything about the ordered parts. I was told one part that was ordered was a discontinued model, so they had to order a different model. I have yet to receive an email stating the new model was ordered even though it has been 4 days since I was told they would order a new model. My husband or myself have also been told on at least five different occasions that we would have a specific person assigned to our claim within 48 hours, but this has not happened. It has been 11 days since the first time we were told we would be assigned a person to work with for our claim. I have made multiple calls today (7/5/16) to find resolution for this claim. My husband and I were hung up on as soon as our claim number was identified during at least 6 different calls. When my husband finally spoke to a manager and we voiced our complaints that multiple representatives of the company told us incorrect information, the manager said he “cannot control other people.” He repeatedly told me he had no control over what other people in the company say or do. I asked to speak to someone who did have control, and he said, “no one does.” This is the type of customer service this company provides… they claim they have no control over what their employees do. - CONS: My husband filed a claim on 6/21/16 that our air conditioner has stopped working. It has been two weeks since the original claim was placed and I have not received even a timeline on when our air conditioner will be fixed. Temperatures have exceeded 90 degrees multiple days during these 2 weeks, which threatened the safety of my dog. On 6/22/16 the contractor came out for about 5 minutes and said he had to talk to First American Home Buyers Protection Corporation to see what they would like to do. The contractor reported to me that he filed the report on 6/23/16. A representative lied to my husband during phone conversations on 6/24/16 and 6/26/16 stating the report was not filed yet. The contractor stated he resubmitted the report on 6/27/16. I personally spoke with him immediately after he resubmitted the report. I received an email confirmation that the report was submitted and an email that confirmed parts were ordered at the exact same time (6/27/16 at 9:33am). It would be impossible for the company to receive the report and order the parts at the exact same time, which supports the statement that my husband was lied to about the original report. I called the company on 7/1/16 because we had not heard anything about the ordered parts. I was told one part that was ordered was a discontinued model, so they had to order a different model. I have yet to receive an email stating the new model was ordered even though it has been 4 days since I was told they would order a new model.My husband or myself have also been told on at least five different occasions that we would have a specific person assigned to our claim within 48 hours, but this has not happened. It has been 11 days since the first time we were told we would be assigned a person to work with for our claim.I have made multiple calls today (7/5/16) to find resolution for this claim. My husband and I were hung up on as soon as our claim number was identified during at least 6 different calls. When my husband finally spoke to a manager and we voiced our complaints that multiple representatives of the company told us incorrect information, the manager said he “cannot control other people.” He repeatedly told me he had no control over what other people in the company say or do. I asked to speak to someone who did have control, and he said, “no one does.” This is the type of customer service this company provides… they claim they have no control over what their employees do.